Hello! This tutorial will show you how to configure Contact Form in WordPress based on Contact Form 7 plugin. 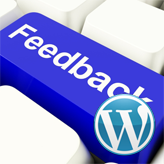 In WordPress contact form is often configured using Contact Form 7 plugin. Now that the Contact Form 7 editing interface is opened, you may start configuring the form. Let’s go through each tab to find out what they are used for. 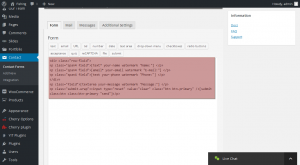 As you can see from the screenshot above, the form includes "Name", "E-mail", "Phone" and "Message" fields, as well as “Clear” and “Send” buttons. Let’s navigate to the Mail tab, which is responsible for setting up the e-mail address, where e-mails arrive. Mail-tags are generated automatically when you add them in the Form field, therefore you can see four mail-tags available for using in the fields, since you have only four tags created (Name, E-mail, Phone and Message). Note! In order to configure the form properly, your fields must contain only mail-tags, which are used in the form structure under “Form” tab, otherwise the form will not work. Insert the e-mail address, where e-mails should arrive, to the “To” field. where you should use your domain name instead of templatetesting.com. Make sure to fill in the rest of the fields with respective tags. Let’s now navigate to the Messages tab. Finally, the Additional Settings tab allows to add customization snippets there. You may find detailed information regarding it here: Additional Settings. This is the end of the tutorial. 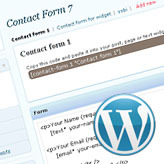 We have learnt how to configure Contact Form in WordPress based on Contact Form 7 plugin. 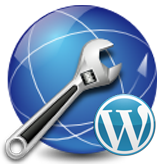 This entry was posted in WordPress Tutorials and tagged configure, contact, form, WordPress. Bookmark the permalink.